Floigan Bros. Episode 1 is an action game for the Sega Dreamcast. 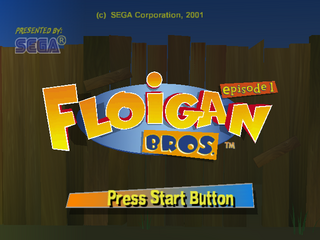 Floigan Bros. was one of the first games announced for the Dreamcast back in mid-1999, but after suffering a series of delays, was not released until July 2001 (and its subsquent November release in Europe ironically makes it one of the last official Dreamcast games to be released in the territory). Despite its name, there was never an "Episode 2". Main article: Floigan Bros. Episode 1/Magazine articles.